Looking for some exciting things to do in Bossier City at night with your friends, family or significant other? Look no further! Bossier has a variety of places that will bring you some entertainment and fun memories to last a lifetime. Check out these 4 places in Bossier City that you can visit at night for a great evening out. The Louisiana Boardwalk in Bossier City located next to Margaritaville Resort and Casino is one of the best places to spend a night out in Bossier. You can go shopping at one of the hundreds of stores like the Nike outlet or Charming Charlie Boutique, or grab a bite to eat at some delicious restaurants like Fuddruckers, Saltgrass Steak House or Sushiko. Catch a movie at the Regal Cinema with some friends or try to win some prizes at the arcade! No matter what you choose, a fun filled night at the boardwalk is waiting for you. Hanging out at Margaritaville Casino is one of the best things to do in Bossier city at night. Filled with several dining options such as the World Tour Buffet, Bamboo Asian Café or Jimmy’s Seafood & Steak, there is a little bit of something for everyone. Bet some big ones or play it safe on the casino floor with the thousands of gaming options! Play some bar games and enjoy some drinks at the Riverview Restaurant & Brewhouse. Every Tuesday is Big Band Tuesday at the Paradise Theater inside the Casino with interesting performances from orchestras and jazz bands! You certainly won’t get bored here. Big Country, or what many locals used to know as Rockin’ Rodeo, is Bossier City’s hottest night club. But they are more than just your typical night club, offering dance and Zumba classes during the week. They also have Karaoke Night and Latin Night on Wednesday’s. Get your best girls together for Ladies Night every Thursday! Go out on a limb and take a ride on the Mechanic Bull. Try the unique yet delicious Alligator Hot Dog and Fried Twinkies at the Big Country Grill or hang back and play some pool. Big Country is bound to leave you and your friends with some great memories! A family friendly restaurant, Flying Heart Brewing & Pub offers tons of craft beers and freshly made pizzas to enjoy at their joint. 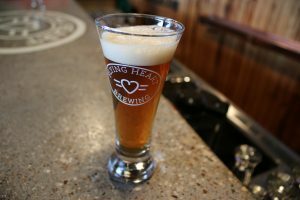 The beers are brewed right here in Bossier, so you can literally taste the town you love at Flying Heart! They offer a fun tasting room experience and you can even rent the venue out for your own private event. Enjoy some live music at a boy’s night out or a date night with your loved one. With a laid back industrial atmosphere, you are promised a fun night here at Flying Heart! Looking for even more fun in Bossier? Check out these things to do in Bossier City this summer.